NEW VIDEO!! I am basking in the Mexican sun right now (THANK GOD!) but I still had to share this video with you! I first published this recipe about a year ago, but I have to tell you that it has continued to be a favorite recipe for our family. In fact, it is a huge treat when I say it’s sushiritto time! Pia even had her 10th birthday Sushiritto themed (good lord that took a lot of sushi rolling on my behalf!) but everyone loved them SO much, and I know you will too! If you follow me on instagram, then a few weeks ago you would have seen me and my family making and grubbing down on sushiritos. What is a Sushirito you might ask??? Well that’s what I wanted to know when Pete came home and could not stop talking about them. Have you guys heard about this new restaurant chain in the California Bay Area? Have any of you been there? Well, as soon as I took a look at these huge burrito sized sushi rolls I knew I was in. I have wanted to make homemade sushi with the kids for ages, and I finally got my act together and gathered some of the crucial ingredients for the job. -Really high quality raw fish. I went to Uwajimaya an Asian specialty store in the Seattle area that we are super lucky to have. Talk to your fish monger about the freshest fish that you would like to eat poke style. 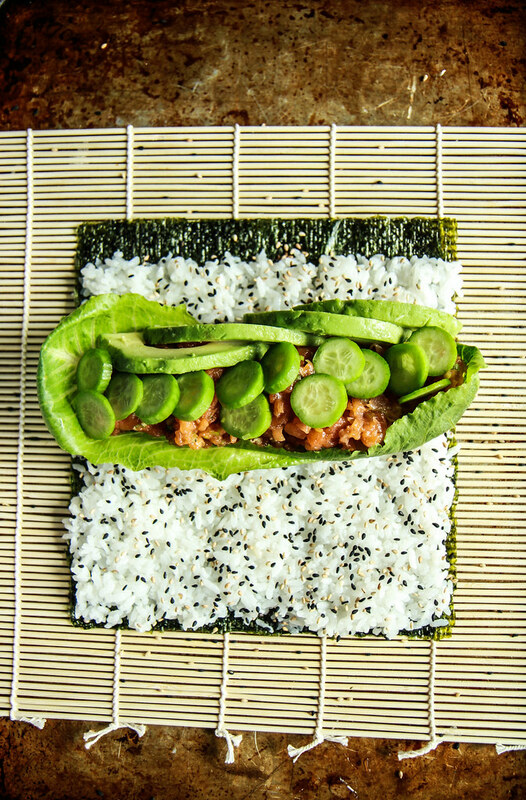 –Sushi Rice. This is not regular sticky white rice! I was also able to find this at Uwajimaya, but here is a great recipe for making your own sushi rice! –A sushi Matt, which ranges from $2-$5 on Amazon and was $1.75 at Uwajimaya. After that, it is really up to you. The sky is the limit!! Coco did avocado, fried tofu and potato chips. 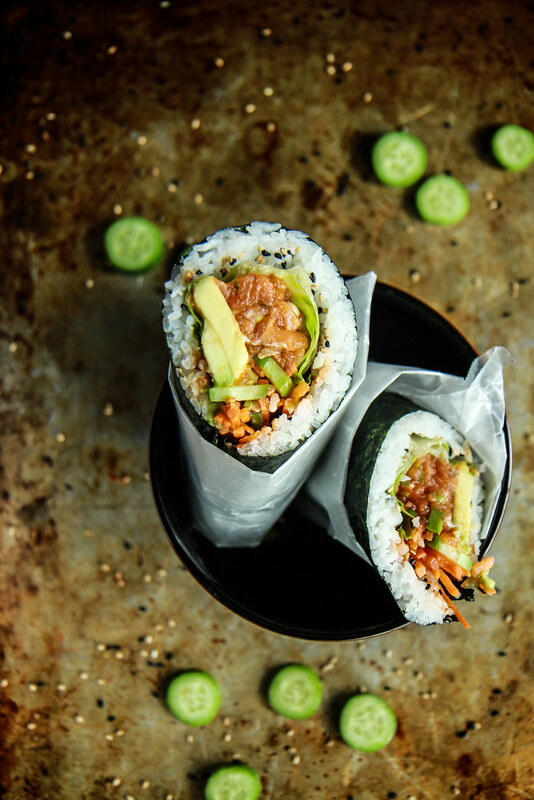 In fact, all of us crumbled up potato chips into our sushiritos. I may have used jalapeno flavored chips!! 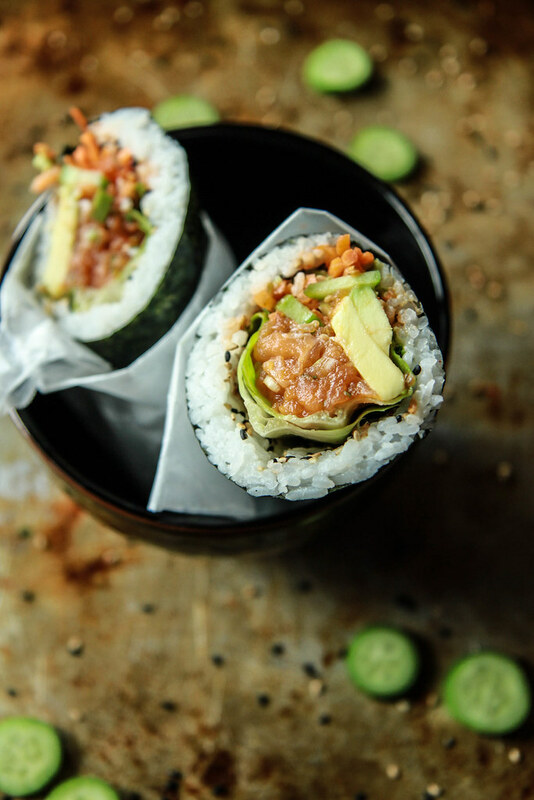 You can customize every last detail of your sushirito and OMG are they delicious! We were all obsessed with our own custom creations and we had so much fun making them. The kids made their own which was messy but very entertaining, and Pete ate like 3 of these no problem! This is a new family favorite and we are trying to make a sushirito/movie night tradition once a month on a Friday night. But Pete and I were also thinking how fun this would be for a grownup Friday night- I woudl love to have a sushirito dinner party with a sake bar. Ideas…. Mince the salmon (which I chop that finely with a heavy chefs knife, or even better- a hatchet). 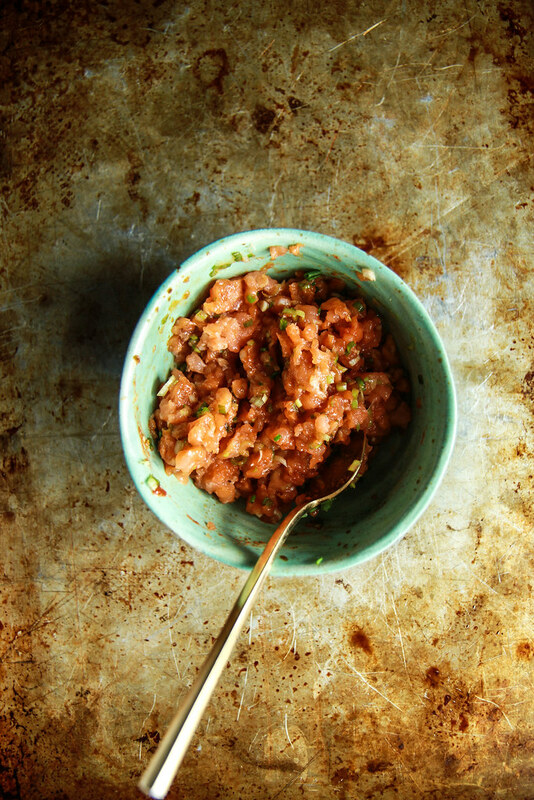 Mix the salmon, sriracha, tamari and the minced green onion together. Set aside. Turn on the gas flame on your stove. Using tongs to hold each piece of nori, just briefly wave the nori through the flame. It is just enough to warm it and become flexible. 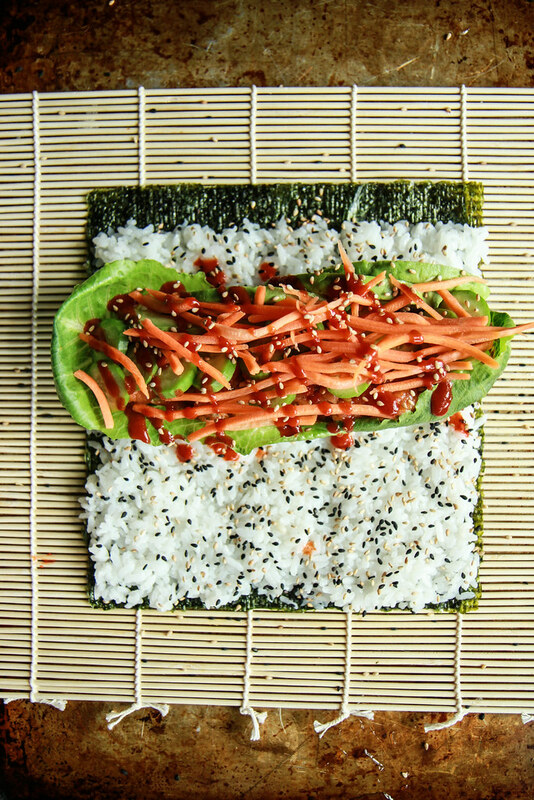 Lay the nori sheet on the sushi matt. Set a little dish of water near where you are working. 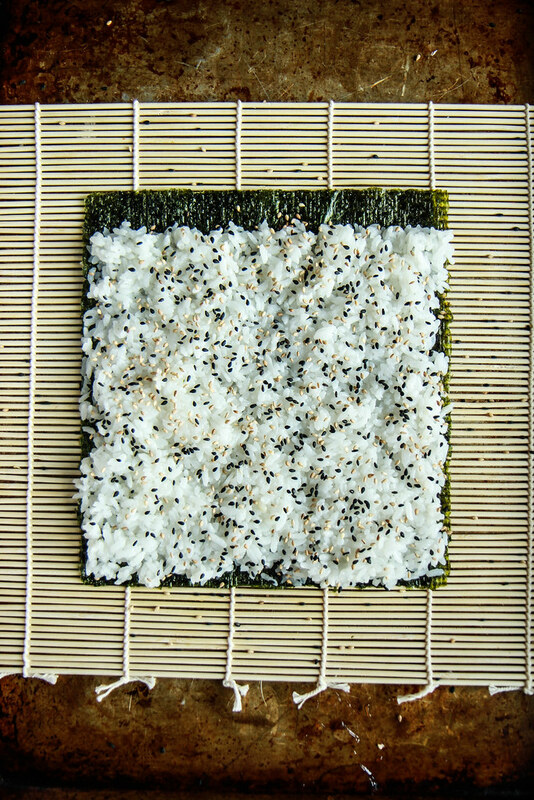 Dip your fingers in the water and then use small handfuls of rice and press it with your wet fingers onto the nori. Continue, wetting your hands often, until you have a thin layer of rice that covers all but a slim strip at the top of the nori. Sprinkle the rice with toasted sesame seeds. Now you get to add the filling! I placed two romaine heart leaves in the center and then filled it with a quarter of the spicy salmon filling. I added avocado and Persian cucumber slices. Then I added shredded carrots and a healthy drizzle of sriracha and a few more sesame seeds. Gently roll the sushiritto up, using the matt to help you. I use the water dish to use my fingers to wet the strip of exposed nori that will help seal the edge of the roll up. The filling on this is much larger than a normal sushi roll, so you have to do it tightly and let it kind of dry at the seam for a minute before you pick it up. Now slice it in half and serve immediately and then make your next one! Gently roll the sushiritto up, using the matt to help you. 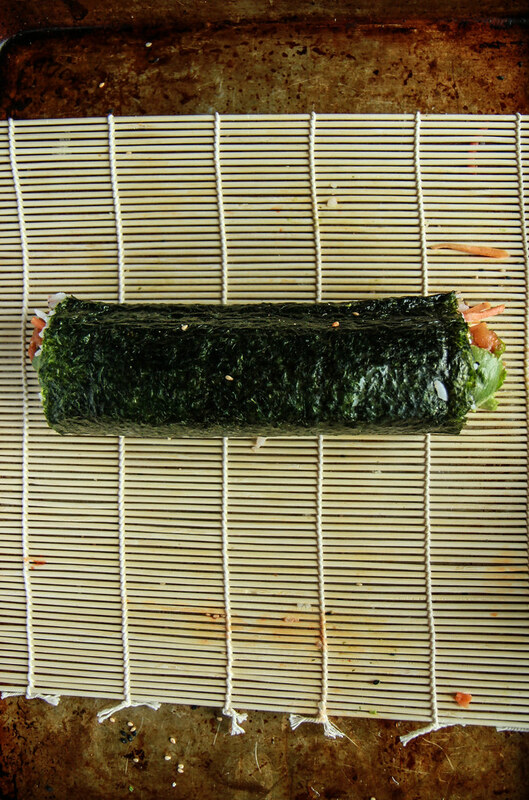 I use the water dish to use my fingers to wet the strip of exposed nori that will help seal the edge of the roll up. The filling on this is much larger than a normal sushi roll, so you have to do it tightly and let it kind of dry at the seam for a minute before you pick it up. Now slice it in half and serve immediately and then make your next one! What a fun idea, my boys would love to help me assemble these! Love the sound of these sushiritos! 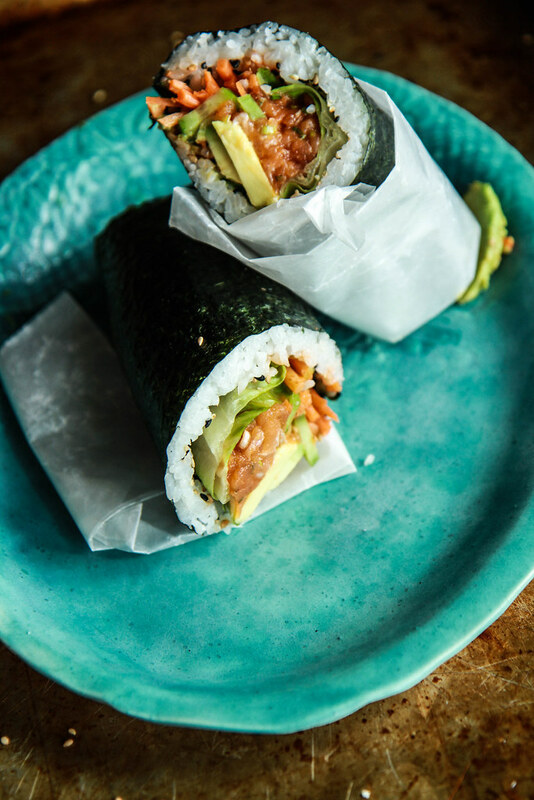 Who would have thought combining sushi and burritos would be SO delicious?! Yum! I’ve got to get my hands on one of these! I’ve been with friends when they’ve ordered these, and it’s awesome to see you tackle making, photographing, and posting a sushirito! Love it! If I made this for my husband he would lose his mind! Looks amazing! Finally made this tonight. It was amazing! Definitely going to make it again. Pretty sure it’s sushi mat, not Matt 😉 These look delicious! These look great and I love the video! Make sure to soak up some extra sun for me – I need it! Can’t wait to make this tonight… I will keep u posted on the reviews I get from my family. Where did you purchase the premade sushi rice? I just got mine at Uwajimaya- a local asian grocer! I love it! so easy and delicious. I’ll take the spicy salmon please! YUM! SUSHIRITO!!!! OMG I love it! Such a fun idea! I think I could actually handle making these because they are large and less cumbersome than normal small ones lol. LOVING this combo of ideas and flavors! 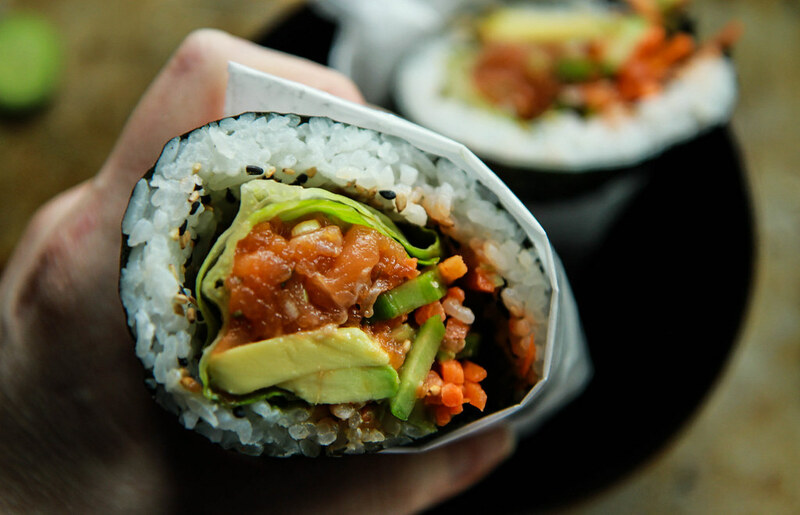 I NEEEEED to get my hands on one of these sushirittos!! I live for sushiritos!!!! Sharing! Wow, they look awesome. Here I didn’t realize I made sushirito’s the first time I made a California roll. Mine were definitely fuller than you get at a restaurant. My grown kids and I are having so much fun making sushi together.